Aluminium smelters operate on a batch process with several hundred pots or cells. It is imperative that they are continuously serviced if they are not to allow the liquid metal to solidify. This requires continuous crane availability. Thus, it is a critical application. The buildings are hundreds of metres in length and special measures must be taken to ensure cranes can be removed for servicing. All of these require significant design input on the part of the crane rails installation designer and installer. To add to this smelters are typically located where electrical power is in abundance. Thus, they may be near the source of coal, natural gas or hydropower and a long way from industrial centres. Gantrail have been installing continuously welded rails in smelters since the 1970's. The design of steelworks cranes has been a main contributing factor in national and international crane design rules as they see the most arduous duty. The crane rail installations take more punishment than in any other industry. 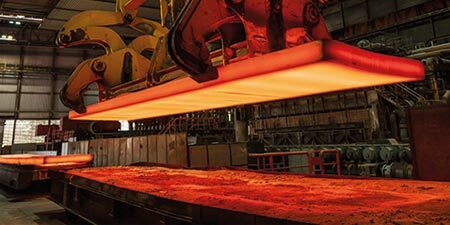 The Gantrail products were developed in the steel industry and are still widely used in all the main buildings, in the coke and blast furnace areas and in the port facilities. In the steelmaking areas, the cranes travel relatively slowly but have the heaviest of loads to carry. Downtime is near impossible for repair and replacement of worn out materials. In the mill area, the loads may be lighter but the speeds are much higher and the continuous cross travelling adds to the complex of forces. This where Gantrail product rise to the challenge. 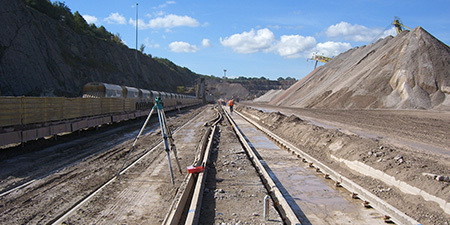 Crane and rail installations are often limited in length other than for railway movements. However, the duties that are encountered are most arduous. The atmosphere carries abrasive and corrosive products. This combined with a need for near continuous running make installing when in construction the only easy time for the rail.